The San Diego Workforce Partnership’s TechHire San Diego places individuals from backgrounds traditionally underrepresented in the sector into tech internships. TechHire focuses on areas like digital marketing, software development and robotics. As the program has grown, a gap began to show in the form of an overabundance of TechHire candidates with IT (e.g. IT systems and network support) backgrounds and a relatively low demand for technicians, support specialists and other similar roles in San Diego caused by outsourcing. It was clear something needed to be done to help job seeking San Diegans get their foot in the revolving tech door. The TechHire team decided to start at home, calling on the Workforce Partnership’s IT department to offer a coveted in-house opportunity to a TechHire intern. In February 2019, Emin Aghayev was brought on board. Little did he know, his experience would set the groundwork for a new internship program for individuals looking for work experience in the tech sector, a San Diego priority sector. Fondly referred to as the PriorIT Internship, the experience provides an opportunity to gain hands-on work experience while practicing networking skills and developing professional contacts who can mentor interns and help them to grow in their career path. Prior to this internship, Emin had been looking for work in his field for more than a year. He first connected with TechHire in May 2018, but had difficulty securing an internship or employment experience due to the extremely limited opportunities available. The TechHire team was excited to make this opportunity available to him and is looking forward to extending the opportunity to another TechHire participant at the conclusion of Emin’s 150-hour internship. This program will function on a rolling basis, with a new intern being brought on after the previous intern completes their work experience. The goal is to ultimately assist TechHire participants in being successful in their careers, not to simply provide a temporary experience. Perhaps the most important support offered is a recommendation or referral to various employer partners coming directly from Workforce Partnership IT Director Jose Dias. We anticipate that the internship experience coupled with a referral from an industry professional will help pave the way for future opportunities for PriorIT interns. “My advice to future interns is to continue trying to get certifications—starting from entry-level,” said Emin. 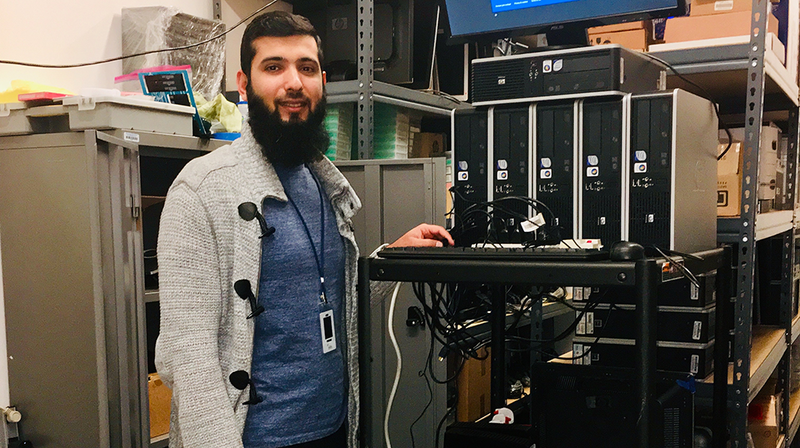 Grateful for the experience, Emin notes the importance of having hands-on help desk experience and encourages others to pursue opportunities like the PriorIT Internship. We are excited to announce that Emin got his internship extended with the Workforce Partnership and was offered a part time job with a local IT company due to his strong work ethic and internship referral. Congratulations, Emin! If you are a job seeker looking for opportunities in tech, click here to learn more about TechHire San Diego. If you are an employer who would like to offer internships or employment opportunities to TechHire participants, please contact business@workforce.org.